In the bowl of a stand mixer, dissolve yeast in warm water. Add 2 cups of the flour and all other ingredients to the batter and mix with dough hook until just combined. Add remaining flour 1 tbsp at a time until dough no longer sticks to the sides of the bowl. Remove dough from bowl and place in a clean, lightly-greased bowl. Cover and let rise until doubled, about 1 hour. Punch down risen dough and shape into an oval, stretching from the top of the loaf to underneath the bottom. Place shaped loaf in a lightly-greased 8 x 4-inch loaf pan. Cover and let rise until doubled, about 30 minutes. Meanwhile, preheat oven to 350°F. Once dough is ready, bake 15-20 minutes until golden brown. Remove from oven and allow to cool completely on a wire rack before slicing. Call it luck. Call it fate. Call it serendipity. Call it whatever the heck you want. This bread was meant to be. With fall peeking its cool head around the corner, tomatoes are popping up red and gold and green zebra stripes all over the place. They're piled in heaps at the grocery store, brimming from boxes at the local farmers market and cheerily hanging from the vines in my mother's garden. Thank goodness I'm a fan of tomatoes, otherwise I wouldn't know what to do with the bagful my mom handed me as a charitable gift (it's going into a tomato pie, but that's a different story). 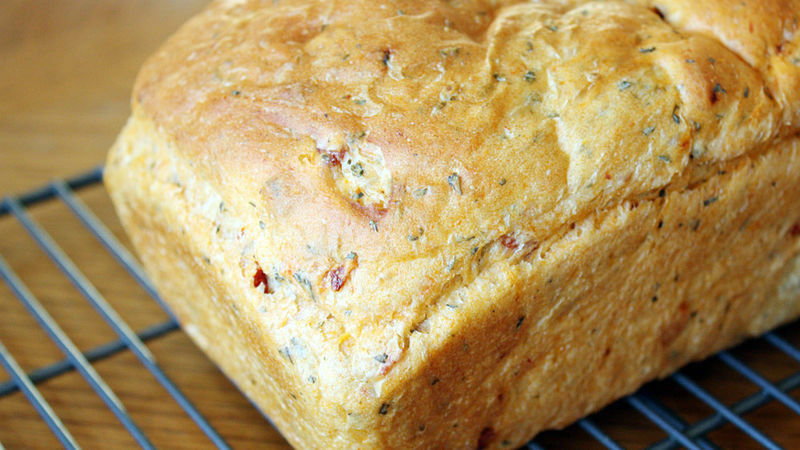 Unfortunately, I didn't have the bagful of fresh-off-the-vine heirloom tomatoes when I made this Sundried Tomato Basil Bread, but I did happen to have sundried tomatoes from a local farm lying around. When chopped up and mixed with sweet dried basil in an airy, Italian-like loaf, it makes the perfect sandwich bread with yummy mozzarella or provolone cheese melted and gooey in the center. But I'm getting ahead of myself here. What makes this bread so meant to be (see "serendipity," above) is how easy it is to make. I kid you not -- this loaf took me less than two and a half hours to make from beginning to get-in-my-belly. For a yeast bread, that's pretty amazing. All you have to do is mix together the ingredients, let the dough rise (and it should, at lightning speed), shape the dough, put it in a loaf pan and let rise a second time (again, lightning speed, times two) and bake it in the oven for a maximum (and I'm being generous here) of 20 minutes. Then, voila! A delicious sandwich loaf just begging to be eaten with a bowl of tomato soup on the first chilly day of fall. Once you make and taste this yummy bread you, too, will agree that fate that brought you two together.